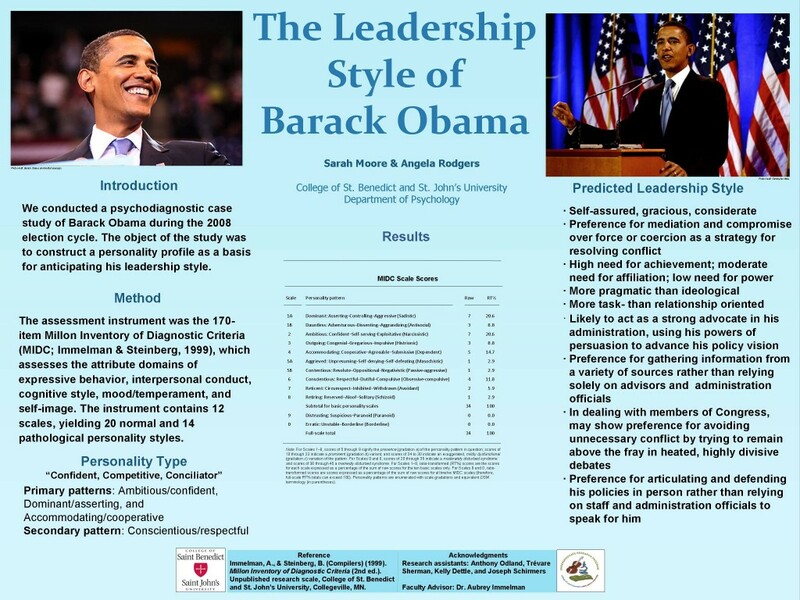 “The Personality Profile of President Barack Obama: Leadership Implications.” Research poster presented by Sarah Moore, 44th annual Minnesota Undergraduate Psychology Conference, April 18, 2009, College of Saint Benedict, St. Joseph, Minn. The research, conducted at the Unit for the Study of Personality in Politics, was directed by Aubrey Immelman, Ph.D. 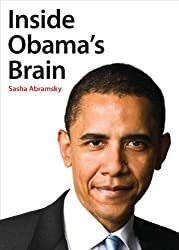 The profile reveals that Barack Obama is ambitious and confident; modestly dominant and self-asserting; accommodating, cooperative, and agreeable; somewhat outgoing and congenial; and relatively conscientious. The combination of ambitious and accommodating patterns in Obama’s profile suggests a “confident conciliator” personality composite. Leaders with this personality prototype, though self-assured and ambitious, are characteristically gracious, considerate, and benevolent. They are energetic, charming, and agreeable, with a special talent for settling differences and a preference for mediation and compromise over force or coercion as a strategy for resolving conflict. They are driven primarily by a need for achievement, but also have substantial affiliation needs and a modest need for power. Aubrey Immelman, PhD, associate professor of psychology at the College of Saint Benedict/Saint John’s University in Minnesota, says the variable that most distinguishes Obama from the two previous presidents is conscientiousness – one of the “big five” personality factors in standard psychology (everyone has all five, in differing degrees; the others are openness to experience, extroversion, agreeableness, and neuroticism). 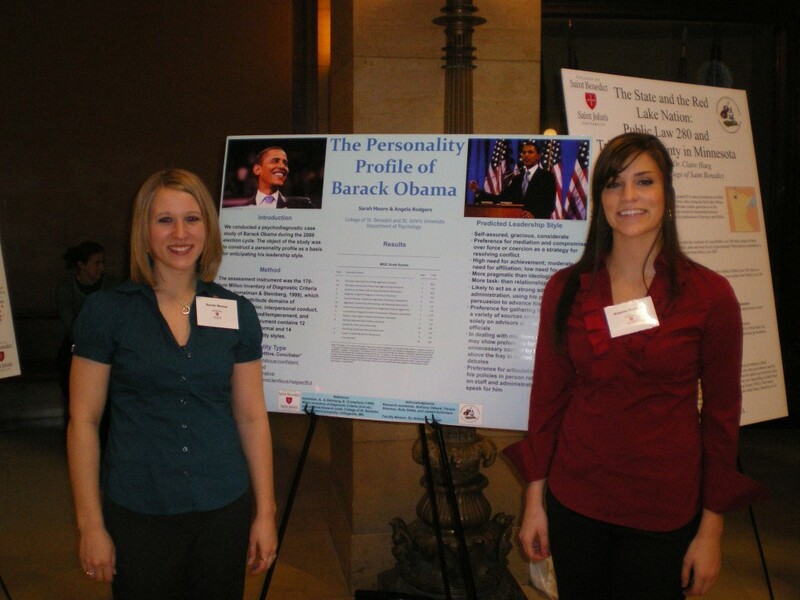 Sarah Moore and Angela Rodgers present their research on “The Personality Profile of President Barack Obama: Leadership Implications” in the State Capitol rotunda, St. Paul, Minn., Feb. 19, 2009. 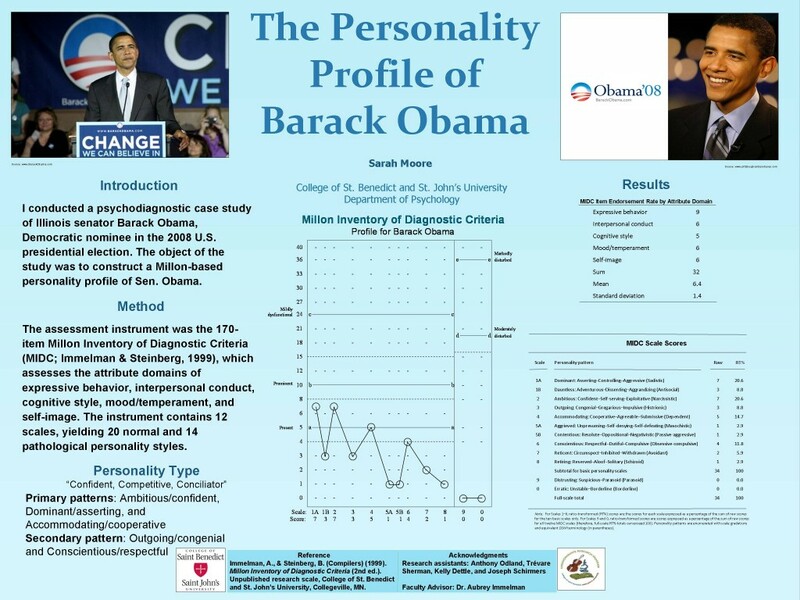 The research, conducted at the Unit for the Study of Personality in Politics, was directed by Aubrey Immelman, Ph.D.